This autumn, the Tasmanian Museum and Art Gallery (TMAG) is proud to present an exhibition of quintessential Australian landscapes and stunning portraits from the National Gallery of Australia (NGA). 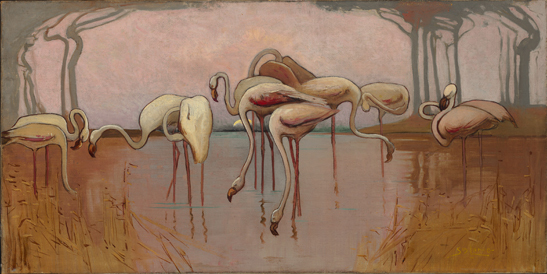 Capital and country: the Federation years 1900–1914, which opens at TMAG tomorrow, is the NGA’s first major exhibition to focus on Australian painting from this formative era of the nation’s history. The exhibition celebrates the art of the newly-federated Australia alongside the work of Australians working in Europe during the early years of the 20th century. "We are delighted to be taking this major exhibition to regional audiences around Australia to help celebrate the national capital’s centenary year," NGA Director Dr Ron Radford AM said. TMAG Acting Director Jennifer Storer the exhibition provided Tasmanian audiences with the rare opportunity to view paintings from the national collection, which are scarcely off display in Canberra. "And since the museum reopened almost one year ago today, our own collection of works from the Federation period has been on display for the first time in decades. "So visitors will be able to view well-known and loved paintings by Tom Roberts, Frederick McCubbin, Sydney Long, William Charles Piguenit, E Phillips Fox and Ethel Carrick in Capital and country alongside paintings in our own collection by the same artists. "I would like to encourage all Tasmanians and visitors alike to come and enjoy this special exhibition." The exhibition was curated by Miriam Kelly, former Assistant Curator of Australian Paintings and Sculpture at the NGA, in association with NGA Director Dr Radford. A full colour catalogue accompanies the exhibition, and is available for purchase from TMAG’s Museum Shop or the exhibition ticket desk. Capital and country opens at TMAG tomorrow, Friday 14 March and is on show until Sunday 11 May 2014. Entry fees apply to this exhibition: adults $10, concession and TMAG membership groups $8, children aged 8-15 $5 and families (two adults and up to four children) $25. Capital and country is supported by Visions of Australia and the National Collecting Institutions Touring and Outreach Program, Australian Government programs aimed at supporting touring exhibitions and improved access to the national collection for all Australians. The Exhibition Partner is the National Gallery of Australia Council Exhibitions Fund, and the Media Partner ABC Local Radio. The NGA is an Australian Government Agency. Read more about the exhibition at the NGA’s dedicated website. This page was last modified on 15th August 2018.